River City Ransom: Underground is nearly upon us. The game has an official release date of February 27, and it will be arriving on PC, Mac, and Linux via Steam. The new launch trailer is below. And, if you want to soak up some more RCR action, we've also dropped in the gameplay trailer and featurette video. You may also want to check out River City: Tokyo Rumble on the 3DS, which just came out a few months ago. 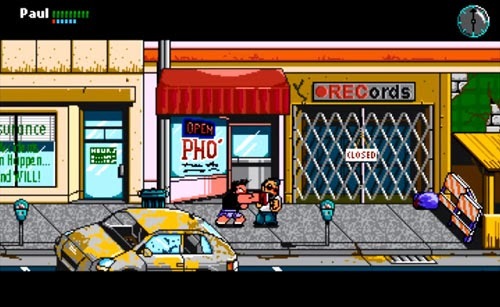 For years, developers have been creating brawlers inspired by Technōs’ River City Ransom. Scott Pilgrim vs. the World: The Game, Fist Puncher, and many others have attempted – to greater or lesser degrees of success – to recapture the simple joy of cracking skulls while exploring a sprawling city and getting some RPG-style upgrades. And now, at long last, an officially licensed follow-up is headed our way courtesy of developer Conatus Creative. Resurrecting the Kunio art style and old-school look, with a few additional animations thrown in for good measure, players explore an even larger open world, with more shops, items, and upgrades. Go it alone or with some friends in 2-4P co-op, and punch some bad guys until they BARF!